Representations of apocalyptic themes and motifs in popular culture has a long history, and a number of books and edited collections have examined their influence on popular film and music. Small Screen Revelations shifts the attention to popular television, examining the ways in which contemporary television drama and news draw on both the language and imagery of apocalyptic texts. 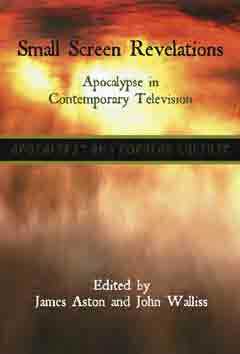 Essays in the collection examine topics such as the representation of apocalyptic prophecies and prophets in television news and documentaries; how news of natural disasters draws on apocalyptic language to frame the events, and how drama series use, develop and sometimes seek to subvert apocalyptic motifs. Thus, Small Screen Revelations offers a repositioning of the importance of television in representing the apocalypse, while providing a pertinent addition to the examination of how and for what purpose the apocalypse is used in popular culture. This is the sixth volume in the series Apocalypse and Popular Culture; see also (1) Walliss and Quinby, Reel Revelations, (2) Gribben and Sweetnam, Left Behind and the Evangelical Imagination, (3) Howard, Network Apocalypse, (4) Partridge, Anthems of Apocalypse, and (5) Clanton, The End Will Be Graphic. James Aston is Director of Studies for Film in the Department of Humanities, University of Hull. John Walliss is Senior Lecturer in Criminology, Department of Social Work, Care and Justice, Liverpool Hope University.